Refreshing and keeping up with our Basic Obedience drills. Motivational games – teaching your dog to cap their adrenaline and then explode out of it on command in a focused fun way – ex. Run to the platform – “ready, set……GO!” – this is done with food or ball. Walks along the many wooded foot paths. Treadmill (not all dogs are eligible). Just hanging out with us! At PUPS, we believe the best training choice is training the owner to train their dog by having the owner work the dog under trainer’s direction. 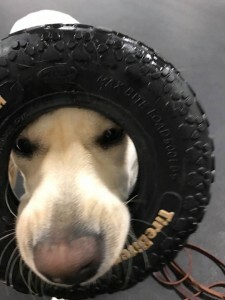 We realize, however, that sometimes there is a need for in-board training to “jump start” the training process or to trouble shoot an issue for a dog already in training with their owner. Sometimes it’s necessary to Jump Start the training with Board and Train to get the dog under some control due to the dog’s size and strength, before the owner takes the leash and begins the training process. Examples of situations that would benefit with jump start, in-board training are; super high energy dogs that are highly rambunctious and their owner just cannot get a handle on the dog. Even attempting to leash up the dog is an ordeal. The dog jumps and bites the owner while on leash. Pulling, launching and lunging on the leash impulsively to where the owner cannot hold the dog. Or so rambunctious in the home with children that it is physically dangerous for the kids. Or, for a dog already in training, sometimes the owner is struggling with a certain part of the training program and dropping the dog off either for a few days straight or dropping the dog during the day and picking the dog up in the evening allows the trainers to identify why the dog is struggling with that part of the training and then work the dog through it and ultimately have the owner do it with the dog, therefore, avoiding frustration with both dog and owner. The ultimate goal, however, is always for the owner and dog to work together. Includes exercise and walks – weather permitting. Available to PUPS’ past and present clients only. *Penalties apply for late cancellations. PUPS offers a unique alternative to doggie daycare. It’s a doggie-LESS daycare and instead offers, training, exercise and play with the trainers! For those days you need to work long hours, or are having work done in your home, or are attending a social event away from home for the day, or need a little help with their current training, whatever the reason, you may drop your dog off in the morning and pick them up in the evening! Your dog will receive two refresher training sessions as well as plenty of exercise with the trainer, not other dogs! PUPS has a huge room, self-propelled treadmill, jumps, cavellettis, and tons of balls and toys to challenge your dog and satisfy your dog’s physical and mental energy needs. This option offers a safe and more productive alternative to doggie daycare environment where so many dogs can yield so many negative results. Contact Karen Decker at 443-545-9598 or via email for pricing and training specifics. Every dog is different and pricing is also determined by goals. *For more info on any of the Boarding/Training services and to check availability, email us at pupsmd@aol.com or phone us at 443-545-9597 or 443-545-9598.